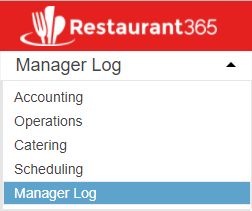 The Manager Log Module in Restaurant365 is a fully integrated Log application. It provides a one stop screen for your Restaurant Managers. Within the Manager Log, DSS data can be viewed and updated at a glance, Logs can be created and recorded with ease, recurring Task Lists can be utilized and tracked, and Document Libraries can sort and store Restaurant Operations documents. To activate the Manager Log Module, please contact your Sales Representative, or Restaurant365 support (support@restaurant365.com). Create Task Lists and set Repeat Schedules. Create Document Library Categories where Documents can be uploaded and stored. Below is a list of training articles to learn more about each part of the Manager Log module and also a detailed explanation of security and navigation within the module. Once the module is activated, it can be accessed by Users with the requisite security roles. Accounting Managers will have full access while Restaurant Managers and Schedulers will have limited access. Manager Log User - this role gives Employees access to enter logs and review and complete tasks. No administrative rights are included in this role. Employee Users: Employees that have been granted access to the Restaurant365 App via the ‘App Access’ checkbox on their employee record will now also exist as Users in the Users list in the Administration section of the Accounting Module. This Employee to User conversion process will happen automatically whenever an employee is granted ‘App Access’ on their employee record. In order for these employees to access the Manager Log, a User with ‘User Setup’ will need to add the ‘Manger Log User’ security role to each of these Users. This can be accomplished on the Employee User Record, via the User Roles screen, or via the Users & Security section in the Setup Assistant. Click here for more information on Employee App Access. Users can access Manager Log features by logging in through a web browser and selecting 'Manager Log' from the module selector at the top of the left nav. This will switch the view of the left nav to show all Manager Log lists and views. 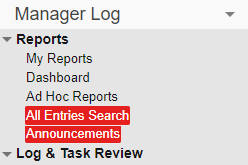 Creating new records associated with Manager Log can also be accessed from the 'Mgr Log' menu in the top ribbon.